A chemical peel is a skin care treatment that uses a carefully crafted chemical solution to address your skin issues. The chemical peel is applied to the skin and can be done on the face, neck and even your hands. During the application, the peel penetrates your skin and depending on the depth of penetration, your skin will eventually begin to exfoliate itself, revealing a new layer of healthy skin. A chemical peel can also improve the texture of your skin by making it smoother. Chemical peels are an amazing tool in my skin care tool box and I highly recommend them to anyone who is unhappy with the appearance of their skin. 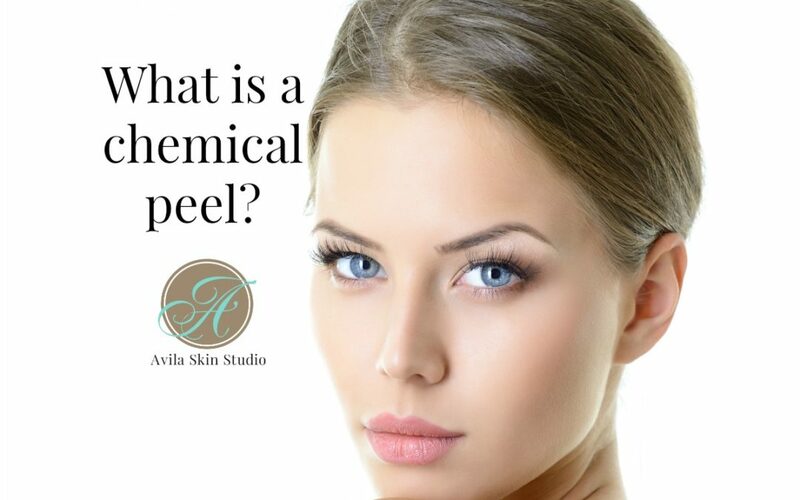 What to expect when getting a chemical peel at Avila Skin Studio? All of my chemical peels are hand crafted with the client’s current skin condition and their future goals in mind. To start, it is an Avila Skin Studio policy that I do not perform chemical peel services on new clients at their first visit. Why you ask? Because I need time to get to know your skin! For first time clients looking to get a chemical peel I recommend you start with an Avila Signature Facial. This will give me an opportunity to thoroughly evaluate your skin and make appropriate chemical peel recommendations. Once you’re ready for a chemical peel, please discontinue use of Retinol and/or any other vitamin A derivative products for one week prior to your service. You should also refrain from exfoliating one week prior to your service. On the day of you come in just as you would for any other appointment and let me do the rest! You can see results in as little as one treatment however to maximize results I recommend you do a series of treatments. This month I am offering a special on 6 treatments. You can save $130 when purchase 6 treatments for $350. Also, after your treatment, you must purchase the after-care kit to take home with you and this month I’m offering 15% off all after-care products. If you have questions about getting a chemical peel service, please contact me at amy@avilaskinstudio.com or by phone at (469) 283-8185! If you’re ready to schedule your chemical peel, click here.